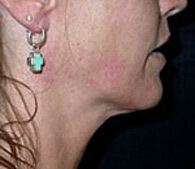 Skin tightening: Thermage | Neck, sagging skin treatment. San Diego Dermatology and Laser Surgery. Dr. Lupton was one of the first physicians in the US to use the Thermage device, using it regularly in the office since early 2002. Skin tightening with Thermage is a state-of-the-art, non-invasive treatment that tightens the skin and stimulates new collagen formation with improvement in facial contours and sagging skin. 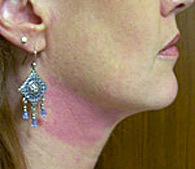 The Thermage device can be used virtually on any part of the body - although the jawline and neck are the most common. The eyelids, abdomen, thighs, knees, and hands may all be safely treated. The Thermage system volumetrically heats the deep layers of the skin while cooling the epidermis to non-invasively smooth, tighten and contour the skin.